PHOENIX — Phoenix native Andre Magdelano doesn’t play golf and has never been invited to play the sport. Magledano’s experience and views echo that of many Latinos, who are underrepresented in the sport. According to the U.S. Census Bureau, 16.0 percent of the U.S. population was Latino as of 2010. However, just 11.7 percent of golfers were Latino, according to a 2010 study of minorities by the National Golf Foundation. This starts in Latin America, where most courses are private and off limits, according to Alzucena Maldonado, founder of the Latina Golfer’s Association. This isn’t the case at Turquoise Valley Golf Club in Naco, a stone’s throw away from the border between Mexico and the United States. It is open to the public. 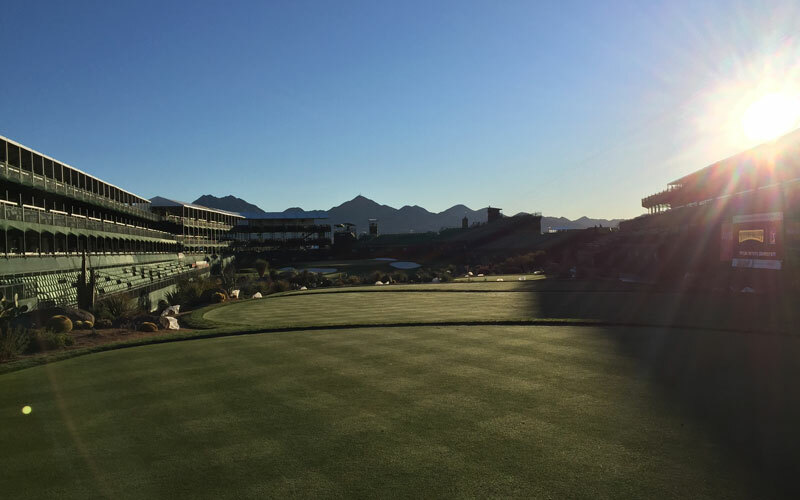 Founded in 1908, it’s the oldest course in Arizona and is in a majority Latino community. According to course general manager Bob Barnes, 70 percent of workers at the course are Latino, including some who cross the border everyday. Barnes has priced a round of golf according to the community where the course resides, at $27 to $37 based on weekday or weekend, but admits it’s still not affordable for Latinos who don’t have well-paying jobs. While Barnes’ course caters more toward the casual golfer, if a Latino golfer wants to become elite, they have to pay more money and play on higher level courses than what Barnes is offering. Such is the case with Desert Edge High junior Aaron Ramos, who won the individual Arizona Division II state championship in 2015 after finishing tied for sixth as a sophomore. He picked up the game from his father, David Ramos, when he was 6. As a single father, David had to stop playing so he could afford the equipment and tournament entrance fees for his son. David said he has put more than $3,000 into his son’s equipment. “Anywhere we go and we try and practice to give him better conditions to practice at it’s been tough because they’re so expensive,” he said. One player who inspired Ramos to play was Puerto-Rican-born Chi Chi Rodriguez, who won eight times on the PGA Tour in the 1960s and 1970s. One opportunity provided to Latinos now that wasn’t in Rodriguez’s time is the PGA Tour Latinoamerica. It’s an 18-tournament, 13-country tour with 200 members; 130 of are fully exempt. The top five finishers at the end of each season earn a spot on the Web.com Tour, a minor league of sorts where players can work toward earning a spot on the PGA Tour by placing well in tournaments over the course of a season. Two players from the PGA Tour Latinoamerica, Bronson Burgoon and Zac Blair, are currently on the American PGA Tour and ranked 272nd and 137th in the world respectively. The need for Latin American players as role models goes hand in hand with growing the game among Latinos. Players like Lee Trevino and Rodriguez are now gone. Fewer elite players are originating from Latin America than in the past which can lead to a lack of interest or inspiration to play the game. According to the National Minority Golf Association, the number of African-Americans playing golf stood at 700,000 in 1992. Tiger Woods then won three U.S. Amateur Championships and turned pro in 1996. By 1998, one year after Woods won his first major, over 4 million African-Americans played golf. Those numbers, however, have not translated to more African American golfers on the PGA Tour. One success story from Latin America is Colombian Camilo Villegas, who has four PGA Tour wins since joining in 2006 and quickly rose to fame with a unique crouching putting stance. The biggest lingering questions seem to be where is that “somewhere” for the Latino community and whom should be targeted. The PGA Latinoamerica caters to professionals and can provide role models but it still isn’t teaching the game itself. Bringing in new, young Latino golfers is a struggle, yet 78 percent of Latinos in the United States have never picked up a golf club and only 1.8 percent of golfers who are Latino are between the ages of 6 and 17, according to the NGF. Programs like the First Tee provide life skills and teach values within the framework of golf for children, but according to Silvario the main problem remains awareness of the game. He once tried to give out tickets to a couple during a tournament in Playa Del Carmen, Mexico and they weren’t even aware they were allowed to go. One group raising awareness is the Latina Golfer’s Association, which uses golf as a business and networking tool while introducing Latinas to the game. Silverio also said the PGA Tour is exploring footgolf, where a soccer ball is used instead of an actual golf ball and the players use their feet instead of a golf club. The idea is to tie the game of golf to a sport already popular among the Latino population in soccer. Barnes at Turquoise Valley has found his own way to grow the game. He hosts quinceaneras and weddings at his course. Once the Latino members from the community see the course, they’re often inclined to come back and play, he said. “The Mexican community endorses a lot of family events like those things and frankly spend a lot of money on it and we cater to that,” he said. The broader challenge remains finding a way to get older millennials involved, which is proving to be more of a challenge. The balance is delicate trying to market a sport which takes an entire morning to play to a generation which seemingly can’t focus on more than one thing. According to a 2015 study done by Microsoft, humans were able to focus on one task for 12 seconds in 2000. That number has dropped to just 8 seconds over the past 15 years. According to the 2010 NGF study, there are 5.8 million Latinos who are interested in golf but have never played. And it only takes one to find the next Ramos, Villegas, Trevino, Angel-Cabrera or Rodriguez.